Housing starts, one of the presumed strengths in the economy, took a dive in December. The Econoday Consensus Estimate was for 1.200 million starts vs. the actual report of 1.14 Million. Housing starts and permits both fell back in December but follow large gains in November. Starts came in at an annualized 1.149 million rate in December for a 2.5 percent monthly dip while permits came in at 1.232 million for a 3.9 percent decline. Yet both of these readings for November surged more than 10 percent. Year-on-year, starts are up a healthy 6.4 percent with permits especially strong at 14.4 percent. Starts for both single-family homes and multi-family homes fell in the month, down 3.3 percent to a 768,000 rate for the single-family category and down 1.0 percent to 381,000 for multi-family. Year-on-year, both are close at respective gains of 6.1 and 7.0 percent. The breakdown in permits shows a downdraft for multi-family homes, 11.4 percent lower to a 492,000 rate but which follows very strong gains in the prior two months. Permits for single-family homes rose 1.8 percent in the month to 740,000. Housing completions jumped 5.6 percent in the month to edge over 1 million at 1.013 million, reflecting in part favorable weather. Homes under construction, also benefiting from the winter's mild weather, rose 1.7 percent with the year-on-year rate at plus 18.5 percent. This report is below expectations and soft on a historical basis, but readings still point to respectable strength underway for new housing. The above chart calls into question alleged strength from a historical basis. However, when calculating GDP, what matters is near-term comparisons (month-over-month and year-over-year). Both of those can fluctuate strongly because of weather-related issues. Bloomberg smooths that out via a 5-month moving average. 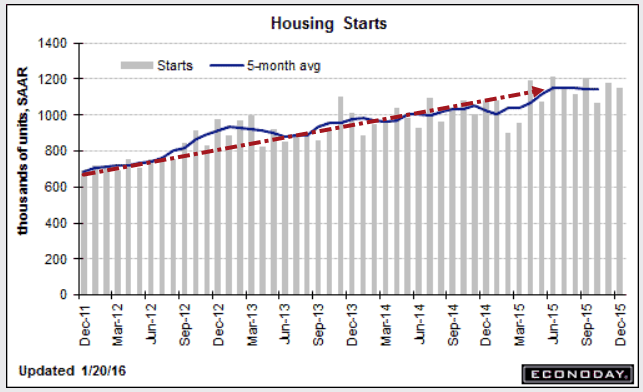 Have housing starts now stalled? November might have one thinking "no", December might have one thinking "yes", and perhaps the 5-month average has one thinking "maybe". Year-over-year comparisons in February and March will be very easy to beat. Starting in April, year-over-year comparisons will be difficult to beat for a long stretch. That's when apparent strength likely starts to look like apparent weakness. Wasn't December supposed to be the warmest ever? Northern Illinois certainly was unusually mild. That should have added to December starts, but it didn't. One typically only hears about the weather when it makes matters worse. In this case, warm weather should have added to starts, but didn't. Regardless of weather-related effects, home prices are no longer affordable. Millennials are priced out. Manufacturing is in recession. Retail sales have stalled despite low gasoline prices. Autos sales were a disappointment. Inventory-to-sales numbers signal trouble, everywhere. My bet is housing joins the parade of weakness.